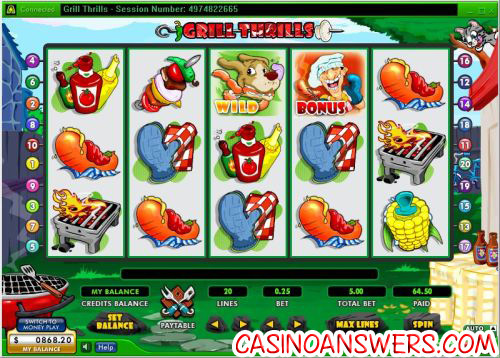 Grill Thrills Video Slot Guide & Review - Casino Answers! Grill Thrills is a 5-reel, 20-line video slot developed by Random Logic, featuring wild substitutes, scatter wins and a bonus game. You can play the Grill Thrills progressive slot at Littlewoods Casino and Reef Club Casino. Grill Thrills is the non-progressive jackpot version of Ultimate Grill Thrills. It doesn’t have a progressive jackpot, but instead has a different paytable, including a higher top jackpot. If you’re looking for the video slot with the progressive jackpot, please read our Ultimate Grill Thrills Progressive Jackpot Slot Review. The first thing you want to do on the Grill Thrills video slot is set your bet per line. The bets are $0.05, $0.10, $0.25, $0.50, $1, $2, $5 and $10. You can also set the number of paylines (up to 20). If you want to spin the reels with all 20 paylines active, use the “Max Lines” button. The minimum bet is $0.05 all the way up to the maximum bet of $200 per spin. With this range of bets available, Grill Thrills is suitable for all types of gamblers. Use the “Spin” button to start playing. The Hamburger symbol is Grill Thrills’ top fixed jackpot. 5 Hamburger symbols on an active payline and you will win 2500 coins. The second highest payout on Grill Thrills is 1000 coins. All symbols pay left to right on consecutive reels, except for the scatter and bonus symbols. All wins are multiplied by the credits bet per line except for scatter wins, which are multiplied by the total bet. Scatter and bonus wins are paid in addition to payline wins. Only the highest win is paid on each of the active paylines. Grill Thrills has an autoplay feature in the bottom right corner. You can play up to 99 autoplay spins. Start the autoplay feature by using the “Spin” button once you have entered your number of spins. You can cancel the autoplay feature at any time by clicking the “Stop” button below the spin counter. To play the Grill Thrills video slot along with its Ultimate Grill Thrills cousin and many more games, you can get a 100% up to £100 signup bonus when you make your first deposit at Littlewoods Casino! 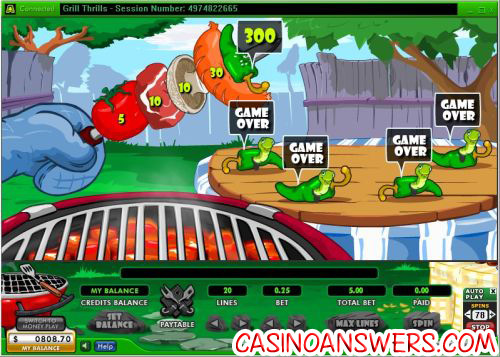 Can USA casino players play the Grill Thrills slot machine for real money? Unfortunately, American players are not able to play at Random Logic online casinos for real money. For an alternative, players in the United States are free to play the iSlots at Vegas Days Casino for real money. These are interactive video slots and they are a lot of fun with a ton of play value and chances to win big. Is there a bonus game on the Grill Thrills video slot? Yes, Grill Thrills has a bonus game that is triggered when three (or more) bonus symbols are hit. You have five turns to create a delicious kebab using food items. Each item will win you a different prize. If you trigger the bonus game with more than three bonus symbols, you will win even bigger prizes. Does Grill Thrills have a progressive jackpot? Grill Thrills does not have a progressive jackpot, however you can find a version of the game with a progressive jackpot. The gameplay is exactly the same with some different payouts and a gigantic progressive jackpot. You can also find Ultimate Grill Thrills at Littlewoods Casino. Is there two grill thrill slot games?